There's an effort to recall Wisconsin governor Walker, whose leadership has led to reforms which is helping do exactly what he said it would: save schools, reduce costs, balance the budget, and save teachers' jobs. The recall is going into action furiously before people see even more clearly how good these ideas are working out. 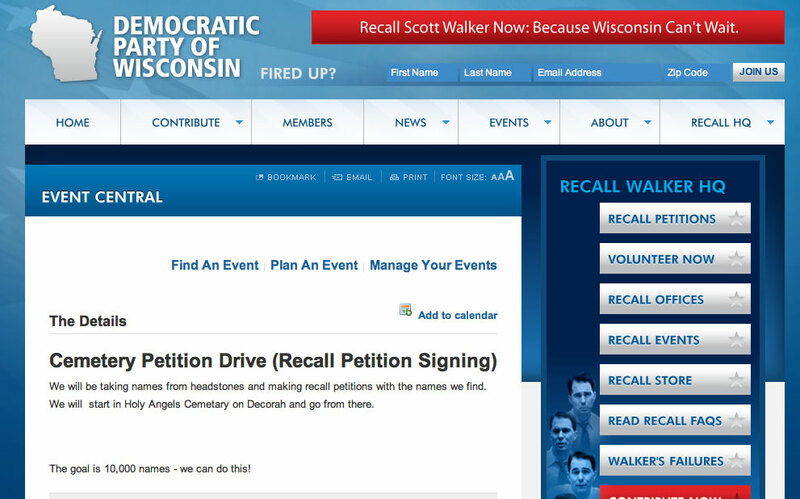 Yes, that really does say collect names from cemeteries for the recall petition. Here's a link to the google cache (while it lasts) from the Democratic Party of Wisconsin. Was it a hoax? Did they get hacked? Was it a joke? No word from the party yet, no one is saying it was fake. Just no one should be particularly surprised, either. There's a reason that George Soros has backed an organization that for years has been working to get leftist Secretaries of State elected across America: their office counts votes and petitions.